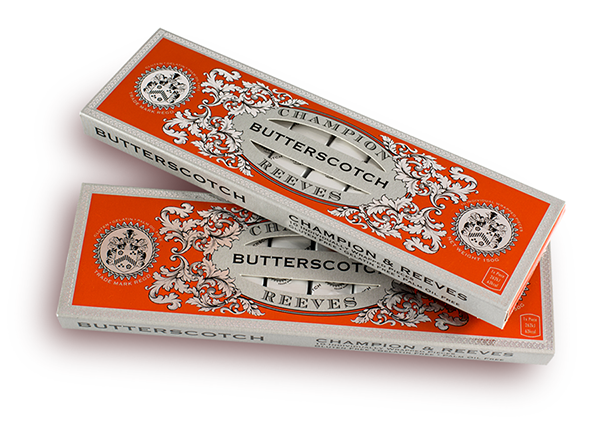 Champion & Reeves Butterscotch pack..
A traditional butterscotch recipe reminiscent of the Callard & Bowser product made many decades ago. Beautifully packaged boxes contain 10 pieces, individually wrapped in waxed silver foil. Sugar and butter are cooked together until they react under heat – a process known as the “maillard reaction” resulting in a rich confectionery golden brown in colour with an irresistible flavour. A velvety, buttery consistency with a subtle taste of orange blossom honey, enriched with healthy mineral ingredients. I opened the Chocolate Gourmet in 1999 to provide the local area with the world's finest chocolate in its various forms. I've always had a fascination with chocolate and a love of Ludlow and to be able to combine two passions together is more than lucky!